At Fairfield Residential, we take our kitchens very seriously. And we take interior design very seriously. Combine both and you’ll find your dream kitchen complete with immaculate details! It’s not just about efficiency and luxury, but also about making our residents feel at home in the most important room in the apartment. 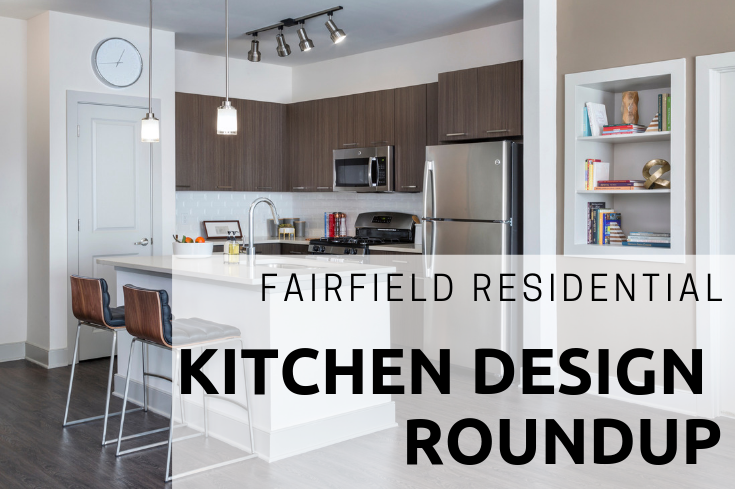 So what makes a Fairfield kitchen stand out? It’s the small design details, color combinations and finishing touches such as quartz countertops, pristine and modern looking backsplashes and wood style flooring. Say goodbye to old school designs and say hello to the modern kitchen of your dreams. Let’s check out some of our favorite Fairfield kitchens across the country! Talia Apartments in Marlborough MA. 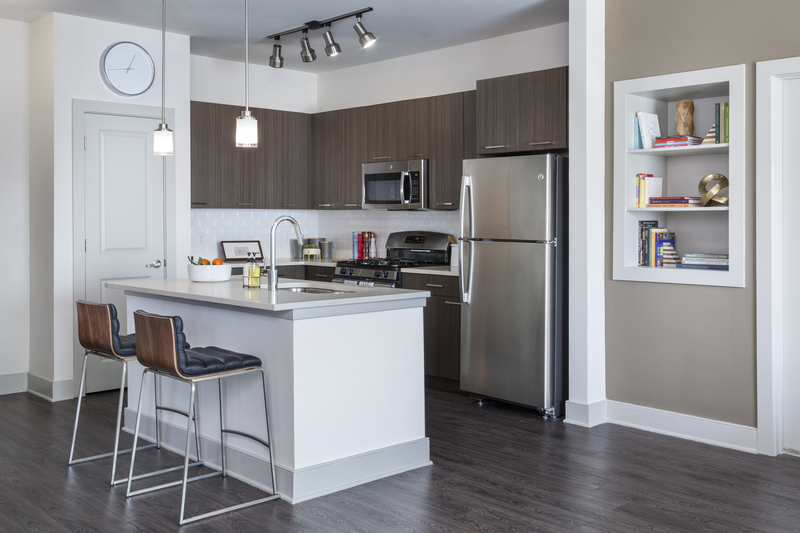 The Sleek Kitchen Design Package at Talia Apartments in Marlborough, MA features rich wood toned cabinets, modern bright white subway tiles and white toned quartz countertops along with dark wood style flooring. Perfect for those looking for a more modern look of light and dark contrasts. 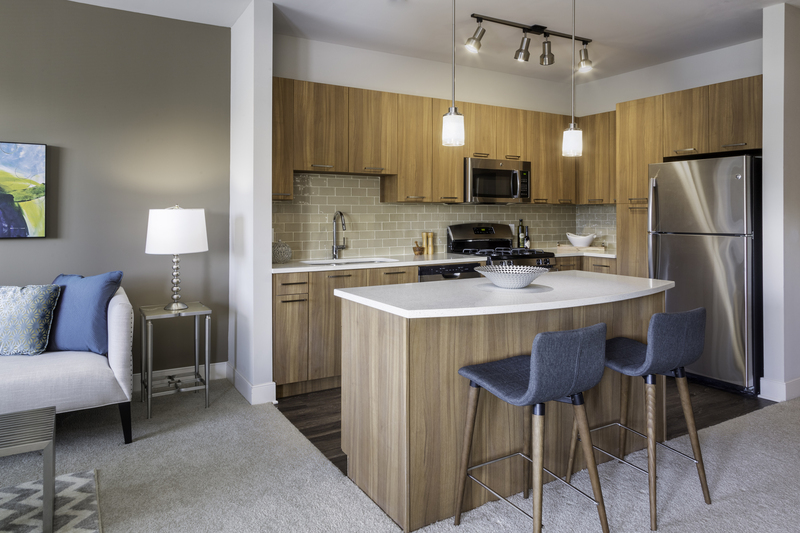 The Harmony Kitchen Design Package also at Talia Apartments in Marlborough, MA features warm wood style cabinets with a natural subway tile backsplash, cream colored quartz countertops and along with rich wood style flooring. Ideal for those looking for a more natural color scheme. Platform Apartments in Atlanta, GA. 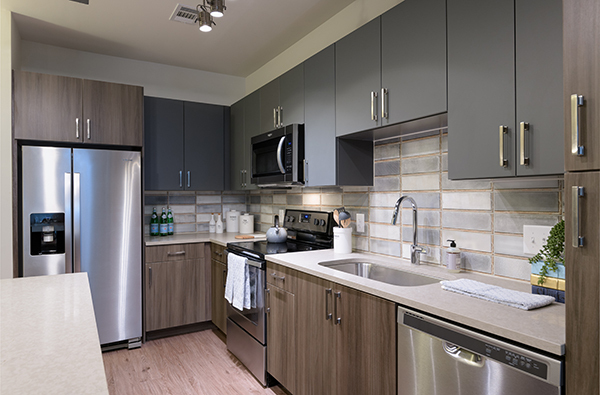 This urban styled kitchen at Platform Apartments in Atlanta, GA features dark gray cabinets, natural colored quartz countertops with stone inspired tile backsplashes along with a kitchen islands complete with pendant lighting in select units. For those that are looking for a more industrial style vibe in their kitchen. Vela on OX in Woodland Hills CA. 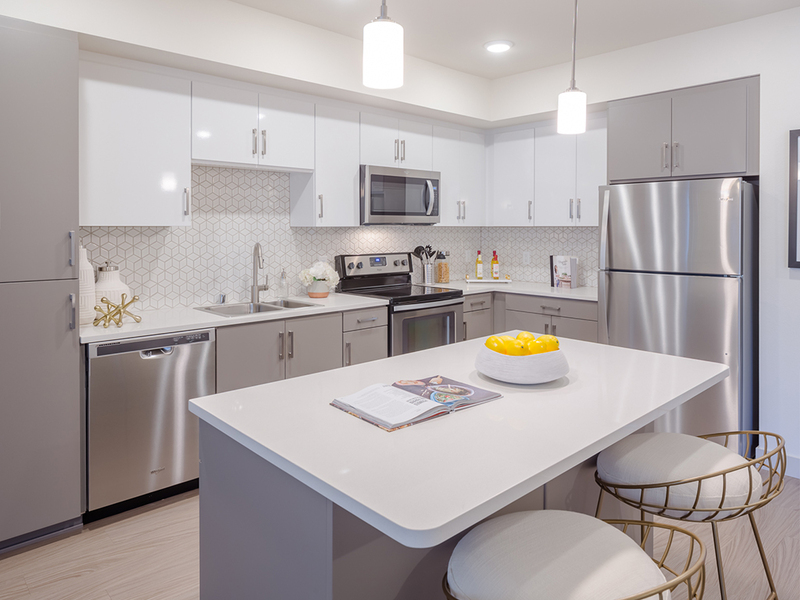 The Parkway Design Package at Vela on OX Apartments in Woodland Hills, CA features polished twilight canyon quartz kitchen countertops, silver mist chevron pattern tile kitchen backsplash, Luasanne flat panel cabinetry and light wood-look plank flooring. Your dream kitchen awaits in west Los Angeles! 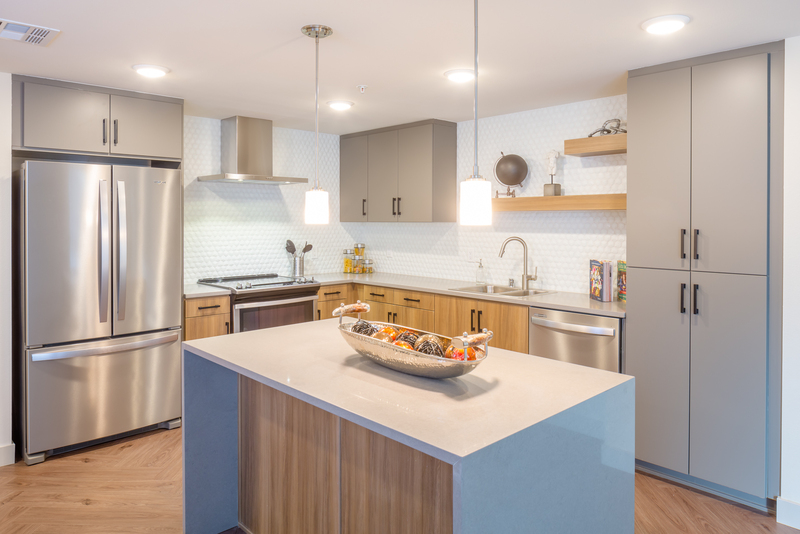 The Cubism Design Package at Aliso Apartments in the Arts District of downtown LA features cashmere lower cabinets, high gloss white upper cabinets & iridescent cube patterned kitchen backsplash, plus polished woven wool quartz countertops. Bright modern luxury is the theme of this gorgeous kitchen. 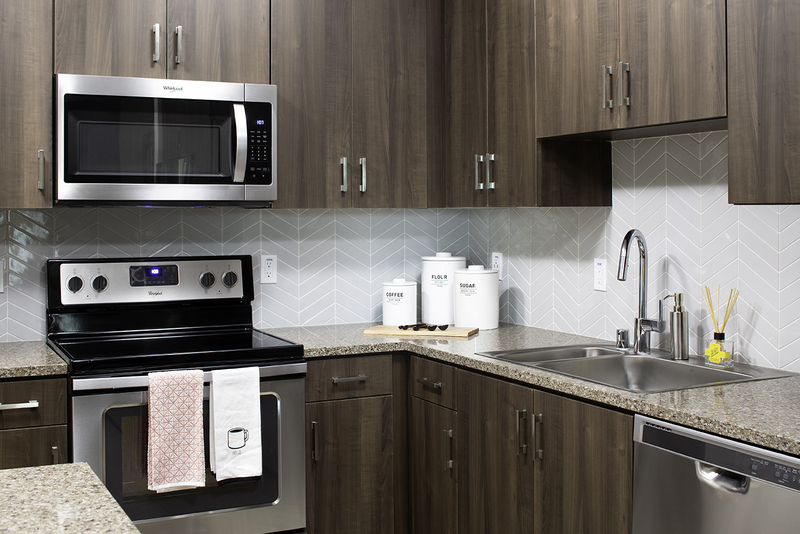 The Deco Design Package, also at Aliso Apartments in the Arts District of downtown LA, features gauntlet grey upper cabinets, talas cherry lower cabinets, & matte white hexagon tile kitchen backsplash; plus polished Berkshire taupe quartz counters with waterfall edge islands. Lastly residents can enjoy luxurious herringbone pattern wood-look plank flooring in this minimalist style kitchen.